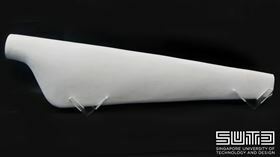 This 1.2m, 5.2kg turbine blade was fabricated entirely with FLAMs made from cellulose and chitosan. Photo: SUTD. As the main structural component in plants, cellulose is one of the most abundant and widespread organic compounds on Earth. Despite decades of extensive research, however, the bottom-up use of cellulose to fabricate three-dimensional (3D) objects is still plagued with problems that restrict its practical applications, including lack of scalability and high production costs. Now, researchers from the Singapore University of Technology and Design (SUTD) have demonstrated the use of cellulose for sustainably fabricating and manufacturing large 3D objects. Rather than plants, however, their approach is inspired by the wall of the fungus-like oomycetes, which contains small amounts of chitin between cellulose fibers. As reported in a paper in Scientific Reports, they have recreated this structure to produce fungal-like adhesive materials (FLAMs) that are strong, lightweight and inexpensive, and can be molded or processed using woodworking techniques. This material is completely ecologically sustainable, as no organic solvents or synthetic plastics were used to manufacture it, and it is scalable and can be reproduced anywhere without specialist facilities. FLAM is also fully biodegradable in natural conditions and outside composting facilities. The cost of FLAM is in the range of commodity plastics and 10 times lower than the cost of common plastic filaments for 3D printing, including polylactic acid (PLA) and acrylonitrile butadiene styrene (ABS), making it not only more sustainable but also a more cost-effective substitute. The researchers have also developed a specific additive manufacturing technique for the material. "We believe this first large-scale additive manufacturing process with the most ubiquitous biological polymers on earth will be the catalyst for the transition to environmentally benign and circular manufacturing models, where materials are produced, used and degraded in closed regional systems," said SUTD assistant professor Javier Gomez Fernandez, who co-led the research with SUTD assistant professor Stylianos Dritsas. "This reproduction and manufacturing with the material composition found in the oomycete wall, namely unmodified cellulose, small amounts of chitosan –the second most abundant organic molecule on earth – and low concentrated acetic acid, is probably one of the most successful technological achievements in the field of bioinspired materials." "We believe the results reported here represent a turning point for global manufacturing with broader impact on multiple areas ranging from material science, environmental engineering, automation and the economy," said Dritsas. "So far, we have been focusing on fundamental technology development, and little time has been invested in specific target applications. We are now at the stage of seeking industrial collaborators to bring this technology from the laboratory to the world." With increases in waste and pollution, the need for more sustainable manufacturing processes is growing. The establishment of a technology based on unmodified compostable polymers that do not require cropland or forest resources for their production will foster the transition to environmentally benign manufacturing and a sustainable society. This story is adapted from material from the Singapore University of Technology and Design, with editorial changes made by Materials Today. The views expressed in this article do not necessarily represent those of Elsevier. Link to original source. 3D printing with cellulose made easier and cheaper. Cellulose could offer a renewable, biodegradable alternative to the polymers currently for 3D printing, thanks to a novel 3D printing process.